In the design world, Fernando and Humberto Campana of Brazil are superstars, their products scooped up by avid collectors all over the globe. Design cognoscenti will no doubt be able to dissect their work much better than I can, but in my mind, what gives the Campana brothers their unique touch is their ability to mix the scrappy ingenuity of Brazilian favelas (shanty towns) with the sophistication of modern design. Their Sushi series of chairs, for instance, are just circles of seemingly discarded fabric and felt, all “glued" together to become a chair. One of their earliest works —I don’t recall the name — included a bicycle tyre as the centrepiece of...was it a bowl? Something unusual like that. The Campanas have often said that they get their inspiration from the way materials are used and reused in the favelas. 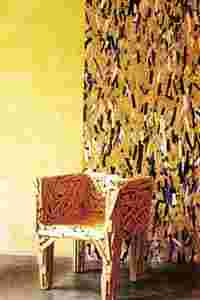 Bicycle tyres become stools; old scraps of fabric become bedspreads and discarded pieces of wood get nailed together into say, a chair. The Brothers did just that in their iconic Favela chair. It has fans all over the world, among them Indian designer Rajiv Saini. There are so many compelling design trends going around today. There is the whole notion of green design — using recycled materials to create everything from bookcases to chairs. My favourite example of this is London-based designer Stuart Haygarth, who collects discarded objects ranging from party poppers to plastic bottles and creates spectacular (and expensive) chandeliers from them (www.inhabitat.com/ 2007/01/18/stuart-haygarths-tide-chandelier). Haygarth’s Tide series for instance uses objects that the tide brings in — spectacles, plastic bottles, old shoes and many others. He painstakingly collects these and puts them together. The “price on request" tag makes me think that these found-object chandeliers ain’t cheap. The point of all this is that creative use and reuse of materials is an Indian quality too yet somehow this has not been translated into our modern design vocabulary. Walk through any Rajasthani village or town and you will find turbans being used as pillows, to draw water from the well and as a shawl during cold winter nights. South Indian women (and perhaps this happens in the north too) routinely use their saris to make “swings" or mobile cribs for sleeping babies. I’ve often thought that it would be nice to combine that womb-like sari-swing design with a modern hammock and see what comes of it. The kolams (drawings with rice flour) that we women draw in our courtyards are masterpieces of pattern and connecting-the-dots. The Taj Connemara in Chennai used to have kolam designs in one of its restaurants earlier but so far I cannot think of a single modern way that these designs have been used. I could be wrong but when I think of modern Indian product design, the only two areas that have grabbed my attention are stainless steel and to a lesser extent, textiles. Companies such as Magppie, artd’inox and Ravissant are refashioning our stainless steel bartans (vessels) using a wonderfully contemporary idiom. One of the Ravissant pieces in which two bowls are balanced alongside each other like a see-saw has me salivating. Ditto with Magppie Design’s ceramic-and- stainless-steel coffee cups. Stainless steel is part of every Indian’s collective unconscious. Before I even knew who Subodh Gupta was, I reacted with delight to his stainless steel sculptures and the reason, I think, was because of the way he had co-opted a quintessentially Indian material, and a humble one at that, and turned it into an object of stunning beauty. Most of us Indians, whether we are dhobis (washermen) or coolies or bankers eat from stainless steel plates. Children carry stainless steel dabbas (lunch boxes) to school. Why not add a bit of style to it, and who better than product designers to do it? Product designers are different from sculptors and other artists in one fundamental respect: They have to encounter the market, and the humility it induces far more regularly. If sculptors are research analysts, product designers are portfolio managers. If painters are global economists, product designers are hedge fund managers. Sales numbers and functionality exert a far greater influence over their design than artistic flourishes. Today, even architects have become designers — Frank Gehry is designing jewellery for Tiffany and Zaha Hadid is making tableware and clothes. I don’t much care for Gehry’s fish designs that mix wood with jewellery but the stunning dress that Hadid created for Swarovski’s runway collection is haunting. I would plonk down my annual salary for it but I don’t think I would still be able to afford it. The reason I love it is that Hadid has mixed the sweeping undulating waves that are her signature into the cut of clothes; she has fused metal and cloth in a startlingly original way — at least from what I could make out in the photos of her grey dress that I saw. Style is hard to define. Reams of pages in fashion magazines are devoted to it. Designers take it apart and even then it is useless because style is subjective — the exuberant overdose that John Galliano thinks is stylish would be anathema to a Japanese. As a people, I believe that we Indians are stylish. I don’t mean the Page 3 socialites who have fallen prey to Western dictates (and brand names) of what constitutes style. I mean that rural India has a style that is entirely and uniquely our own. It is in the upturned jootis and the dignified walk of a turban-clad farmer in Rajasthan; in the crisp folds of a Bengal cotton sari, especially when worn by pretty much any woman in Kolkata; in the green bangles of a koli fisherwoman who goes to Crawford Market; in the pristine white “mundu" dhoti of Kerala politicians including defence minister A.K. Antony; in the graceful walk of any woman who balances a pot of water on her head. Wherever you look in India, we have a style and grace that is a mixture of Bauhaus functionality and Baroquean exuberance. It follows Mies van der Rohe’s dictate that form must follow function and then adds a fillip of colour and je ne sais quoi to it. Every morning after putting my kids in the school bus, I sit down and watch the line of maids who enter our building complex. Not one of them is poorly put together and I’ve heard this said about bais (maids) all over India. They take pride in their appearance and come in wearing neatly-pinned saris, perhaps some jasmine in their hair, maybe a bangle or two and a dangling earring as a nod to current fashion. No make-up, no expensive accessories, just professionals dressed up for their jobs. Are they stylish? I doubt that they think in those terms. They are unstudied but not nonchalant. They pay attention to their clothes but don’t fuss over them. Most of all, their outfits stay true to themselves, with a little extra fillip. If that’s not style, I don’t know what is. Today, Shoba Narayan’s maid wore an unusual anklet that made her stop in her tracks to take another look.